Galicia (spelt identically in Galician and Spanish) is an autonomous community with the status of Historic Nationality in the northwest of Spain. Some Galician nationalists have sought to promote "Galiza", said to be an old Galician variant of the region's name, as an alternative spelling. However, this proposed variant (identical in spelling to the region's name in Portuguese) does not enjoy any official recognition within the institutions of the autonomous community, although the Galician Academy has recently recognised this spelling. The spoken languages are Galician (Galician: Galego, Spanish: Gallego), the local national language derived from Latin, and Spanish (castellano or español), in common with the rest of Spain. Spanish was the only official language for several centuries. Since the end of the 20th century, the Galician language also has an official status, and both languages are taught in Galician schools. There is a broad consensus of support within the region for efforts to preserve the Galician language. The Galician and Portuguese languages are derived from the early Galician-Portuguese (Galego-Português) language. In the Middle Ages, the Galician and Portuguese languages began to diverge because of the political separation of Portugal from Galicia. There remain many similarities between Portuguese and Galician. Orally, these differences are comparable in scope to those between Flemish  a form of Dutch spoken in Belgium  and standard Dutch. A distinct Galician Literature emerged after the Middle Ages. In the 13th century, important contributions were made to the romance canon in Galego-Português. The most notable was by the troubadour Martín Codax and King Alfonso X of Castile, called El Sabio (The Wise). During this period, Galego-Português was considered the language of love poetry in the Iberian proto-romance linguistic culture. The weather is Atlantic, with mild temperatures all over the year. Santiago de Compostela has as average 100 days of rain a year. The interior, specifically the more mountainous parts of Ourense and Lugo, receive significant freezes and snowfall during the winter months. Galicia has preserved much of its dense Atlantic forests where wildlife is commonly found. It is scarcely polluted, and its landscape composed of green hills, cliffs and rias is very different to what is commonly understood as Spanish landscape. Inland, the region is less populated and suffers from migration to the coast and the major cities of Spain. There are few small cities (Ourense, Lugo, Verín, Monforte de Lemos, A Rua), and there are many small villages. The terrain is made up of several low mountain ranges crossed by many small rivers that are not navigable but have provided hydroelectric power from the many dams. Galicia has so many small rivers that it has been called the "land of the thousand rivers." The most important of the rivers are the Miño and the Sil, which has a spectacular canyon. The mountains in Galicia are not high but have served to isolate the rural population and discourage development in the interior. There is a ski resort in Manzaneda in Ourense Province. The highest mountain is Trevinca (2 000 m) near the eastern border with León. Although the region is filled with extensive natural areas, Galicia has had environmental problems in the modern age. Deforestation is an issue in many areas, as is the continual spread of the invasive eucalyptus tree, imported for the paper industry, which is causing imbalances in the indigenous ecosystem. Fauna, most notably the European wolf, have suffered from livestock owners and farmers. The native deer species have declined because of hunting and development. Recently, oil spills have become a major issue, especially with the Mar Egeo disaster in A Coruña and the infamous Prestige spill in 2002, a crude oil spill larger than the Exxon Valdez disaster in Alaska. Other environmental issues include gas flushing by maritime traffic, pollution from fish hatcheries on the coast, overfishing, and the highest incidence of forest fires in Spain, in spite of the wetter Galician climate. Galicia is a land of economic contrast. While the western coast, with its major population centres, and its fishing and manufacturing industries is prosperous and increasing in population, the rural hinterlandthe provinces of Ourense and Lugoare econonomical dependent on traditional agriculture, based on small landholdings called minifundios. However, the rise of tourism, sustainable forestry and organic and traditional agriculture are bringing other possibilities to the Galician economy without compromising the preservation of the natural resources and the local culture. The name Galicia comes from Latin name Gallaecia, associated to the name of the ancient Celtic tribe that resided above the Douro river, the Gallaeci or Callaeci in Latin and Kallaikoi in Greek (these tribes were mentioned by Herodotus). Before the Roman invasion, a series of tribes lived on the region, having  according to Strabo, Pliny, Herodotus and others  a similar culture and customs. These tribes appear to have Celtic culture  there is evidence that the last Galician Celtic speaker died in the 15th century. The region was first entered by the Roman legions under Decimus Junius Brutus in 137 BC/136 BC. (Livy lv., lvi., Epitome); but the province was only superficially Romanized in the time of Augustus. In the 5th century AD invasions, Galicia fell to the Suevi in 411, who formed a kingdom. In 584, the Visigothic King Leovigild invaded the Suebic kingdom of Galicia and defeated it, bringing it under Visigoth control. During the Moorish invasion of Spain, the Moors briefly occupied Galicia until they were driven out in 739 by Alfonso I of Asturias. During the 9th and 10th centuries, the counts of Galicia owed fluctuating obedience to their nominal sovereign, and Normans/Vikings occasionally raided the coasts. The Towers of Catoira (Pontevedra) were built as a system of fortifications to stop Viking raids of Santiago de Compostela. In 1063, Ferdinand I of Castile and León divided his kingdom among his sons. 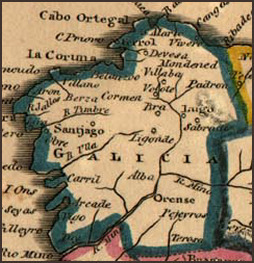 Galicia was allotted to Garcia II of Galicia. In 1072, it was forcibly reannexed by Garcia's brother Alphonso VI of Castile, and from that time Galicia remained part of the kingdom of Castile and Leon, although under differing degrees of self-government. Galician nationalist and federalist movements arose in the nineteenth century, and after the second Spanish Republic was declared in 1931, Galicia became an autonomous region following a referendum. During the 1936-75 dictatorship of General Francisco Franco - himself a Galician from Ferrol - Galicia's autonomy statute was annulled (in common with those of Catalonia and the Basque provinces). The Franco regime also suppressed any offical promotion of the Galician language (although its everyday use was never proscribed). During the last decade of Franco's rule, there was a renewal of nationalist sentiment in Galicia. Following the transition to democracy following Franco's death in 1975, Galicia regained its status as an autonomous region within Spain. Varying degrees of nationalist or separatist sentiment are evident at the political level. The only nationalist party of any electoral significance, the Bloque Nacionalista Galego or BNG, advocates greater autonomy from the Spanish state, and the preservation of Galician heritage and culture. Other factions advocate total independence from Spain, while some smaller groupings aspire to integration with Portugal and the Portuguese-speaking world. However, the nationalist parties have hitherto obtained only minority electoral support at election time. From 1990 to 2005, the region's government and parliament, the Xunta de Galicia was presided over by the Partido Popular ('People's Party', Spain's main national conservative party) under Manuel Fraga, a former minister and ambassador under the Franco regime. However, in the 2005 Galician elections, the People's Party lost its overall majority, while just remaining the largest party in the parliament. In the event, power passed to a coalition between the Partido Socialista de Galicia (PSdeG) ('Galician Socialist Party'), a regional sister-party of Spain's main socialist party, the Partido Socialista Obrero Español ('Spanish Socialist Workers Party') and the BNG. As the senior partner in the new coalition, the PSdeG nominated its leader, Emilio Perez Touriño, to serve as Galicia's new president.